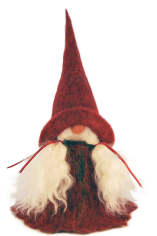 Home / STORE / Asas Tomtebods / Tomte / Nisse. / Hilma. Hilma is a new addition to the Asa Tomtebod family and can be adopted in either red or green. She is approximately 25cm high.